Located in the 6-story KWVE Bldg. 1st Floor, North Entrance, 3000 W. MacArthur Blvd. Adjacent to Main Campus of Calvary Chapel Costa Mesa. "THE ROCKS CRY OUT - Lessons 3 & 4"
Lesson 3: Science Testifies to Creation - The mechanisms of evolution cannot explain the design of life. Lesson 4: Dragons and Dinosaurs - Dinosaurs provide some of the strongest evidence for a biblical worldview. "DNA BATTLES - Were Adam & Eve Historical?" We will watch the 59-minute DVD by Evidences Press, "DNA Battles," followed, after a short break, by 19 minutes of bonus features. The June, 2011 cover article in Christianity Today (CT) lays out several postions for the historicity of Adam and Eve. Francis Collins, director of the National Institutes of Health, started the Biologos Foundations. Biologos is leading the charge for the position that Adam and Eve, if they existed at all, were part of a collective of some 10,000 hominids. The CT article states, "A Biologos paper by Venema and Falk declares it more flatly: The human population, they say, 'was definitely never as small as two . . . Our species diverged as a population. The data are absolutely clear on that.'" But are the data as clear as they state? What has recent research revealed about mitochondrial DNA? Does recent research on nuclear DNA support evolutionary predictions? Hear from 7 scientists and 2 theologians. ​ Chris Rupe, (B.S., Biology), a Logos Research Ambassador, will describe the culmination of four years intense research in the field of Paleoanthropology - his new book, "Contested Bones," co-authored with Geneticist, Dr. John Sanford. Chris is currently a graduate student at Loma Linda University, studying Geology. About our speaker: Chris graduated from Geneseo University in 2009 with a degree in biology. After, he felt led by the Lord to start a creation ministry called Back2Genesis. Since his early twenties, he has been speaking on the topic of creation/evolution as a way to present the Gospel in various settings including local radio and televsiion stations, colleges, universities, middle and senior high schools, teen centers, and church venues from 1st grade to adult-level discipleship classes. Since the fall of 2011, Chris has worked for Feed My Sheep Foundation (FMS). In collaboration with Dr. John Sanford, Chris has been doing numerical simulation research aimed at better understanding the historical problem of Haldane's Dilemma, as well as the problem of fixation of deleterious mutations over deep-time. In August of 2013, Chris presented their research results at the 7th International Conference on Creationism held in Pittsburg, PA. Since then, much of Chris’s research with FMS has focused on the topic of hominin fossils, culminating in the new book, "Contested Bones." Chris is currently enrolled as a graduate student at Loma Linda University. About our speaker: Joseph Kezele studied the sciences and music at the University of Arizona, while earning his B.A. in Russian in 1971, and his M.D. in 1975. He then completed a Pediatric Residency and practiced Emergency Medicine for 25 years in the Phoenix area, and was a diplomate of the American Board of Emergency Medicine and fellow of the American College of Emergency Physicians. He is now retired from the practice of medicine, serves as President of the Arizona Origin Science Association, is Adjunct Professor at Arizona Christian University in Phoenix, teaching Human Genetics, Cell and Molecular Biology, Pathophysiology, Organic Chemistry and Creation Science Apologetics. Dr, Kezele has also been named a Logos Research Associate. He serves as Chairman of Deacons and teaches Creation Science Evangelism at Black Mountain Baptist Church in Cave Creek, Arizona. He has participated in over 21 foreign mission trips, teaching medicine, standard evangelism and creation science evangelism in India, Zambia, Mexico, Russia, Latvia, Lithuania, the Ukraine, Bosnia-Herzegovina, and Armenia. 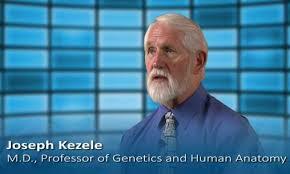 Dr. Kezele is one of the principle presenters in the Institute for Creation Research’s 4 DVD series Made in His Image. Last year, he returned to the Ukraine for three intense weeks of teaching Creation Science Apologetics and Evangelism as part of the activities prompted by the proclamation of the President of the Ukraine recognizing the 500th anniversary of Martin Luther's sparking the Reformation in Germany. If the Lord wills, when Dr. Kezele speaks to us in August, he will have just returned from another mission trip to the Ukraine.